Hypothalamus; Lymphoma; Central Nervous System. Primary central nervous system lymphoma is a well-known entity. However, the hypothalamus is a rare location, especially in adults. Few cases of secondary lymphomas have been reported. We report a case of primary hypothalamic lymphoma in an adult male with normal pituitary functions. Lymphoma should be considered as one of the differential diagnosis of lesions involving the hypothalamic/third ventricular area. A 50-year-old male reported with complaints of memory disturbances and irritability of three weeks duration. His family had noticed that his short-term memory was grossly impaired. There was no associated history of headache, vomiting, fever, seizures, urine incontinence, or gait disturbance. His medical history was insignificant. On examination, he was irritable and confused. Assessment of his higher mental functions could not be done. There was no cranial nerve involvement or motor deficit. Figure 1: (a) Non-contrast computed tomography (CT) of the head showing a hyperdense suprasellar mass. (b) Contrast-enhanced CT showed uniform enhancement of the mass. Complete blood, cerebrospinal fluid (CSF), and radiological evaluation were performed. Serum electrolytes revealed hypernatremia (sodium 155 mEq/dL), which was corrected. His remaining electrolytes, blood sugar, kidney, and liver function tests were normal. His hemoglobin level was 9.6 g/dL, and leucocyte count was 7600/mm3. Lumbar CSF had 56 mg/dL proteins, 49 mg/dL sugar, and 8% lymphocytes. Serology test for tuberculosis with the polymerase chain reaction method and adenosine deaminase (ADA) activity were negative. Computed tomography (CT) scan of the chest, abdomen, and pelvis did not reveal any abnormality. His screening for anterior and posterior pituitary hormones was normal. Before subjecting the patient to a surgical procedure, a routine HIV-screening test was done, which was negative. Brain imaging revealed an enhancing suprasellar mass with areas of restricted diffusion within the mass [Figure 1 and 2]. 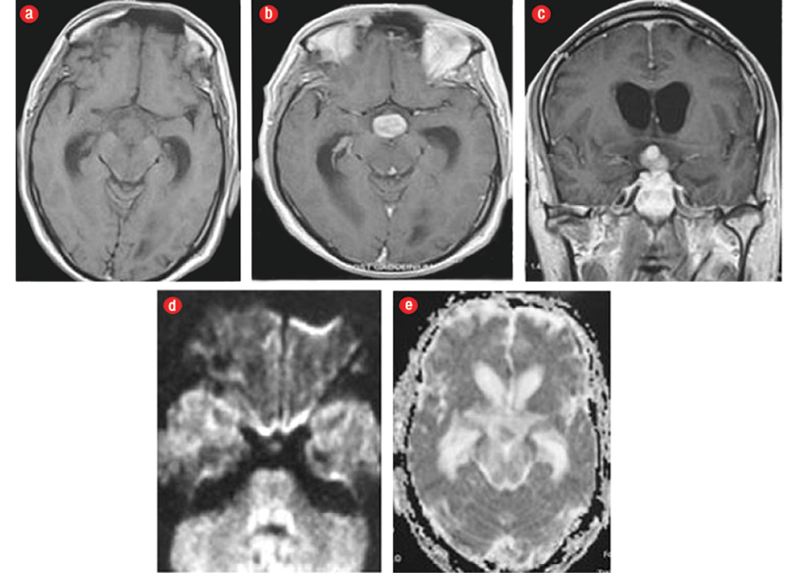 Figure 2: Non-contrast T1-weighted axial magnetic resonance imaging (MRI) of the brain showed an (a) isointense suprasellar mass, (b) post-contrast axial and (c) coronal view of MRI showed solid enhancing lesion in suprasellar region (hypothalamic area). (d) Diffusion-weighted images and (e) apparent diffusion coefficient images showing area of restricted diffusion within the mass. A stereotactic tissue biopsy from the lesion showed features of large B-cell lymphoma. Histopathological examination showed a uniform population of large lymphoid cells. The cells had scanty cytoplasm and were arranged in a typical angiocentric pattern. Immunohistochemistry showed the tumor cells positive for leukocyte common antigen (LCA), and B-cell markers CD20 and CD19 [Figure 3]. Based on these histological and immunohistochemical features, a diagnosis of a diffuse primary large B-cell lymphoma was made. He was referred to a medical oncologist for further management. The patient was given six cycles of an intravenous high-dose methotrexate-based regimen (methotrexate 3.5 gm/m2, vincristine 2 mg/m2, procarbazine 100 mg/m2, and cytarabine 100 mg/m2 (post-radiation)) followed by consolidation therapy of one cycle of whole-brain radiotherapy (40 Gy to the whole brain, 2 Gy/day × 20 days). The patient was put on methylprednisolone 60 mg/day to reduce cerebral edema. After commencement of treatment and as edema subsided there was a significant improvement in his cognition and headache. At three-month follow-up, he was doing well and repeat scans showed noticeable regression of the lesion. 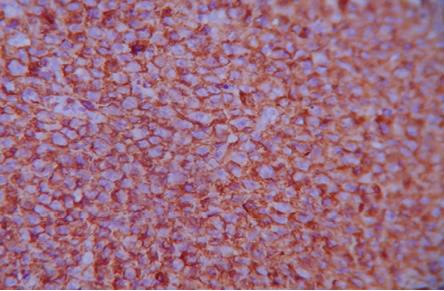 Figure 3: Photomicrograph showing CD20 positive lymphoma cells, magnification = 40 ×. Table 1: Case reporting of central nervous system lymphoma located in the hypothalamic and/or third ventricular region. Thirst, secondary amenorrhoea, cranial diabetes insipidus, paraesthesia lower limbs, unsteady gait, ataxic, spasticity, hyperreflexia. Intranasal desmopressin acetate nasal spray. Computed tomography (CT) head revealed 3 cm lobulated suprasellar-hypothalamic mass. Insidious onset global pituitary failure/ hypopituitarism. Magnetic resonance imaging (MRI)-optic chiasm infiltration, third ventricle compression, pituitary gland normal. Hypothyroidism, secondary adrenal insufficiency, hypogonadism, hyperprolactinemia. Lymph node enlargement, bitemporal hemianopsia, diabetes insipidus (DI) with hypopituitarism (weakness, hypotension, dry skin, constipation, and impotence). Bilateral kidney mass, hydrothorax, hydro retroperitoneum. Seven cycles of cyclophosphamide cncovin (vincristine) prednisone (COP) (cyclophosphamide, vincristine, prednisone). Intraspinal 12 cycles-(cytarabine, Mtx, prednisone). Radiotherapy-36 Gy/20. MRI-intrasellar mass (5 × 4 cm), wide sella, enclosing hypothalamic infindibulum, optic chiasm, cavernous, and sphenoid sinus, elevated III ventricle. Pituitary gland tissue with Large B-cell malignant lymphoma. Headaches, worsening visual acuity/ bilateral blurred vision, bilateral visual field defects, and bilateral optic nerve atrophy. cyclophosphamide hydroxydaunomycin (doxorubicin) oncovin(vincristine) prednisone (CHOP) (cyclophosphamide, vincristine, adriamycin, prednisone). Whole-brain radiotherapy (RT)-40 Gy. CT/ brain MRI-36 mm hypothalamic mass, suprasellar extension and optic chiasm infiltration. Headaches, fever, dizziness, worsening vision, polydipsia, polyuria, dehydration. Difficulty in speech, disorientation, memory loss, seizures and DI, systemic lupus erythematosus (SLE) - 30 years. MRI-hypothalamic mass posterior to optic chiasm, floor of III ventricle, extension to infundibulum, Meckel’s cave. Syncope, night sweats, anorexia, postural hypotension, allodynia affecting trigeminal nerve. Panhypopituitarism. 2.8 cm, hypo-hyper intense mass in hypothalamus, third ventricle. CSF culture, staining negative. General fatigue, disoriented, weakness of right arm, DI. Endoscopic biopsy, whole-brain RT of 43 Gy-24 sessions + boosters of 12 Gy (10). Loss, personality changes, ate and drank ad libitum. Craniotomy - biopsy. Desmopressin for DI, For central nervous system (CNS)- high-dose methotrexate ifosfamide, carboplatin, etoposide. CT-hyperdense mass in suprasellar region. MRI-enhancing suprasellar mass (9 × 6 mm), thickening of pituitary stalk. Infertility, amenorrhea and galactorrhea, weakness, headaches, nausea and vomiting, shaking chills, night sweats, weight loss, diplopia. MRI-bilateral symmetric hypothalamic lesions extending to optic tracts and chiasma. CT chest -pericardial, pleural effusion. Chest pain, hallucinations, paranoia, polyuria, polydypsia, garbled and slurred speech, disorientation. Brain biopsy-primary CNS B-cell lymphoma. Chemotherapy. Third nerve palsy, axillary large-cell non-Hodgkin lymphoma. Cytogenetic studies CSF-mixed-lineage leukemia gene rearrangement. MRI-hypothalamic lesion extending to mesencephalon, anterior commissure, mammillary bodies. MRI spectroscopy-depressed NAA and elevated choline peak. CT-mediastinal nodes (peribronchial). Olfactory hallucination, diplopia, frontal cephalgia, short-term memory dysfunction, lack of appetite, left ptosis, hyperthyreosis, depression. Polydipsia (10 lt), polyphagia, optical hallucinations, illusions. Antidepressants, desmopressin acetate, L-thyroxine and dimethicone, hydrocortisone, and risperidone. Focal infiltration of hypothalamus and lateral ventricles, also L5-S1 mass. Non-Hodgkins diffuse large B-cell lymphoma (L5-S1 mass). Intense back, left leg pain, sleep disturbances, malaise, nausea/vomiting, central DI. Enhancing dumbell lesion, 2.4 × 1.2 cm, involving hypothalamus and pituitary. Diffuse large B-cell malignant lymphoma. DI and headache resolved following therapy. IV high-dose methotrexate-based regimens, one cycle whole-brain RT. MRI-pituitary adenoma with inhomogeneous enhancement extending into suprasellar region, compressing the optic chiasm and invading left cavernous sinus, pons. Diffuse large B-cell non-Hodgkin’s lymphoma. Generalized muscle weakness, headache, right eyelid ptosis. Amenorrhea, vision impairment in right eye. Craniotomy and RT. Optic nerve decompression. Radiotherapy 46 Gy. Diffuse large B-cell primary cerebral lymphoma. Confusion, urinary incontinence, polyuria, polydypsia, weight loss, ataxia, and paresis of oculomotor nerve III. Central hypogonadotropic hypogonadism and central hypothyroidism. RT (39 Gy), desmopressin 10 μg/2 days, intrathecal cytarabine. Improved. Pt 1, MRI-small nodular lesion under hypothalamus (tuber cinereum) caused by lymphoma. Pt 2-hypophyseal fossa small, high signals from posterior pituitary lost. Body aches, high fever, weight loss, polyuria, polydipsia, proteinuria. Patient 1–0.1 mg desmopressin acetate trade name DDAVP, CHOP. Cranial radiation. Patient 2-EPOCH-itoxantrone, cytrabine, and 100 mg/d thalidomide. CT scan shows lymphomas to be iso- to hyperdense lesions. This feature is because of their hypercellularity. Also, lymphomas are homogenously enhancing lesions. Diffusion-weighted magnetic resonance imaging (MRI) shows restricted diffusion because of the hypercellularity of the lesion. The most common histopathological subtypes seen in the CNS are large B-cell lymphoma. The cells are LCA positive (a leukocyte marker) and CD20 positive. Treatment options for primary CNS lymphoma (PCNSL) include corticosteroids, chemotherapy, and radiation. Resection of PCNSL is not a viable treatment option except in those with brain herniation due to mass effect.25,26 Although PCNSL is a potentially curable brain tumor in an immunocompetent patient; the best treatment strategy has yet to be defined. Current treatment options include biopsy with corticosteroids, radiation therapy, and chemotherapy. Many PCNSLs respond to corticosteroid sensitively but will relapse rapidly when used alone. Whole-brain radiation therapy alone does not produce remissions but is usually combined with chemotherapy as consolidation therapy, but we should be aware of treatment-related neurotoxicity, especially in elderly patients. Our patient was finally diagnosed subsequent to biopsy. He responded well to the initial chemotherapy and subsequent whole-brain radiation therapy. Today, he is in complete resolution in terms of clinical appearance and MRI imaging. Lymphoma should be included in the differential diagnosis of lesions involving the hypothalamic/third ventricular area. Imaging and stereotactic tissue biopsy are of immense help when establishing the diagnosis. Chemoradiotherapy is the treatment of choice. 1. Yasargil MG. Primary CNS non-Hodgkin lymphoma and primary intracranial sarcoma. In: Microneurosurgery. Stuttgart, New York: Georg Thieme Verlag; 1996. P. 375-378. 2. Lanzieri CF, Sabato U, Sacher M. Third ventricular lymphoma: CT findings. J Comput Assist Tomogr 1984 Aug;8(4):645-647. 3. Pomper MG, Passe TJ, Burger PC, Scheithauer BW, Brat DJ. Chordoid glioma: a neoplasm unique to the hypothalamus and anterior third ventricle. AJNR Am J Neuroradiol 2001 Mar;22(3):464-469. 4. Eby NL, Grufferman S, Flannelly CM, Schold SC Jr, Vogel FS, Burger PC. Increasing incidence of primary brain lymphoma in the US. Cancer 1988 Dec;62(11):2461-2465. 5. 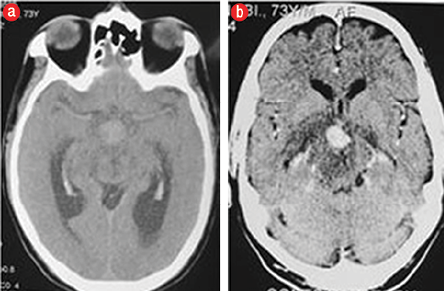 Alic L, Haid M. Primary lymphoma of the brain: a case report and review of the literature. J Surg Oncol 1984 Jun;26(2):115-121. 6. Patrick AW, Campbell IW, Ashworth B, Gordon A. Primary cerebral lymphoma presenting with cranial diabetes insipidus. Postgrad Med J 1989 Oct;65(768):771-772. 7. Chourmouzi D, Boulogianni G, Delaroudis S, Drevelegas A. Hypopituitarism due to hypothalamic B-cell lymphoma. JBR-BTR 2005 May-Jun;88(3):116-117. 8. Bolanowski M, Kuliszkiewicz-Janus M, Sokolska V. Diffuse malignant lymphoma type B with optic chiasm infiltration, visual disturbances, hypopituitarism, hyperprolactinaemia and diabetes insipidus. Case report and literature review. Endokrynol Pol 2006 Nov-Dec;57(6):642-647. 9. Rudnik A, Larysz D, Blamek S, Larysz P, Bierzyńska-Macyszyn G, Właszczuk P, et al. Primary pituitary lymphoma. Folia Neuropathol 2007;45(3):144-148. 10. Akhaddar A, Baite A, Naama O, Elmostarchid B, Safi L, Boucetta M. Hypothalamic lymphoma with symptoms mimicking pituitary apoplexy. Intern Med 2009;48(6):491-492. 11. Biasiotta A, Frati A, Salvati M, Raco A, Fazi M, D’Elia A, et al. Primary hypothalamic lymphoma in a patient with systemic lupus erythematosus: case report and review of the literature. Neurol Sci 2010 Oct;31(5):647-652. 12. Coulter I, Garrioch S, Toft A. An atypical cause of trigeminal neuralgia and panhypopituitarism. Br J Radiol 2010 Dec;83(996):1087-1089. 13. Takasu M, Takeshita S, Tanitame N, Tamura A, Mori M, Fujihara M, et al. Case report. Primary hypothalamic third ventriclular Burkitt’s lymphoma: a case report with emphasis on differential diagnosis. Br J Radiol 2010 Feb;83(986):e43-e47. 14. Chan TW, Hoskins P. Panhypopituitarism secondary to hypothalamic involvement in a woman with diffuse large B-cell lymphoma. J Clin Oncol 2010 Apr;28(11):e165-e166. 15. Fadoukhair Z, Amzerin M, Ismaili N, Belbaraka R, Latib R, Sbitti Y, et al. Symptomatic hypopituitarism revealing primary suprasellar lymphoma. BMC Endocr Disord 2010 Nov;10:19. 16. Layden BT, Dubner S, Toft DJ, Kopp P, Grimm S, Molitch ME. Primary CNS lymphoma with bilateral symmetric hypothalamic lesions presenting with panhypopituitarism and diabetes insipidus. Pituitary 2011;14(2): 194-197. 17. Schwingel R, Reis F, Zanardi V, Queiroz L, França M Jr. Atypical sites of lymphoma in the central nervous system. Arq Neuropsiquiatr 2011 Jun;69(3):566-567. 18. Quigg TC, Haddad NG, Buchsbaum JC, Shih CS. Hypothalamic obesity syndrome: rare presentation of CNS+ B-cell lymphoblastic lymphoma. Pediatr Blood Cancer 2012 Nov;59(5):930-933. 19. Broussalis E, Kraus J, Kunz AB, Luthringshausen G, McCoy M, Muss W, et al. Cerebral localized marginal zone lymphoma presenting as hypothalamic-pituitary region disorder. Case Rep Neurol 2011 May;3(2):129-135. 20. Antic D, Smiljanic M, Bila J, Jankovic S, Todorovic M, Andjelic B, et al. Hypothalamic dysfunction in a patient with primary lymphoma of the central nervous system. Neurol Sci 2012 Apr;33(2):387-390. 21. Papanastasiou L, Pappa T, Dasou A, Kyrodimou E, Kontogeorgos G, Samara C, et al. Case report: Primary pituitary non-Hodgkin’s lymphoma developed following surgery and radiation of a pituitary macroadenoma. Hormones (Athens) 2012 Oct-Dec;11(4):488-494. 22. Malaise O, Frusch N, Beck E, Servais S, Caers J, Caers J, et al. Panhypopituitarism and diabetes insipidus in a patient with primary central nervous system lymphoma. Leuk Lymphoma 2012 Dec;53(12):2515-2516. 23. Yang J, Zhao N, Zhang G, Zheng W. Clinical features of patients with non-Hodgkin’s lymphoma metastasizing to the pituitary glands. Oncol Lett 2013 May;5(5):1643-1648. 24. Sklar EM, Schatz NJ, Glaser JS, Sternau L, Seffo F. Optic tract edema in a meningioma of the tuberculum sellae. AJNR Am J Neuroradiol 2000 Oct;21(9):1661-1663. 25. Makhdoomi R, Nayil K, Rayees A, Kirmani A, Ramzan A, Khalil MB, et al. Primary CNS lymphoma in immunocompetent: a review of literature and our experience from Kashmir. Turk Neurosurg 2011 Jan;21(1):39-47. 26. Gerstner ER, Carson KA, Grossman SA, Batchelor TT. Long-term outcome in PCNSL patients treated with high-dose methotrexate and deferred radiation. Neurology 2008 Jan;70(5):401-402.